The Quickest & Easiest Way To Install Tow Lights On Any Vehicle Yourself! Towing a car behind an RV? You need tow lights! The best option: install magnetic tow lights to a cargo carrier that fits in the hitch of your tow vehicle! This DIY Roadmaster base plate installation took far more than the 2 hrs alluded to in the instructions. But all you need is a heavy-duty drill & torx set! The New Chrysler Corporation proudly proclaims their intent to continue with the Jeep line. Time will tell, as this newly restructured company comes on line. 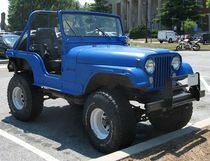 Hopefully, the proud Jeep will continue on, much to the delight of loyal Jeep owners and enthusiasts everywhere. 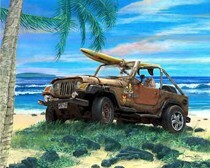 Here’s a strange but true story of how easy it is for a Jeep to end up in the ocean — when you’re riding along the beach! 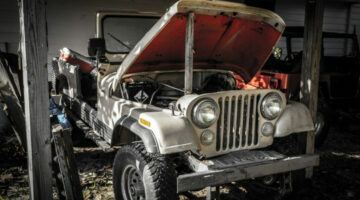 I got a good deal on a Jeep CJ5 because the exhaust was leaking badly and oil was pooling under the engine. I looked it over and took a chance that I could handle the repairs. After writing the check for $3,500 I took her home.